This is my son at the park. This is my son at the park without his iPad. 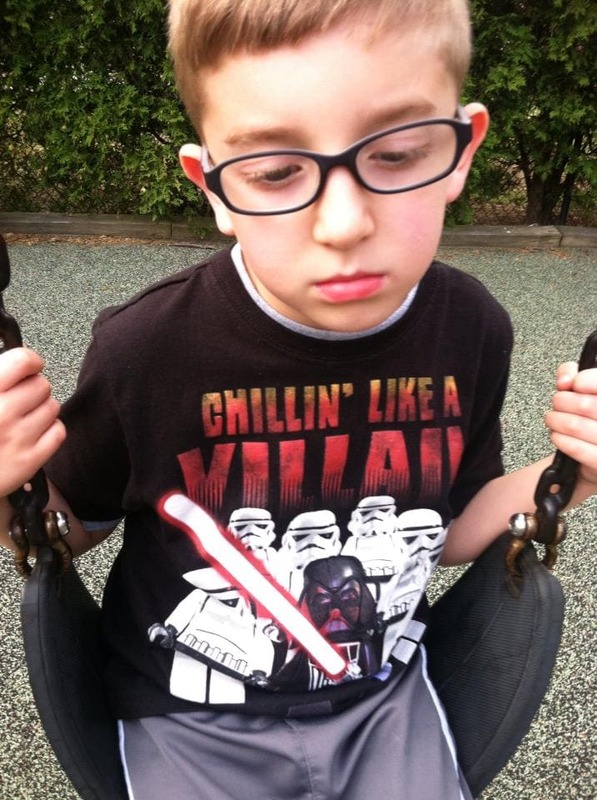 This is my son at the park mad at me because I wouldn’t let him stay home and building castles or kill Creepers or… WHATEVER on Minecraft. Instead, I wanted him to play outside and get some fresh air. I was at the park for over an hour and I am telling you – Liam did not warm up for 45 minutes. He basically sat on that swing and sulked to NO END. I kept telling him to cheer up but he couldn’t get over his Minecraft fixation. Anyone else have this issue? I know some Facebook friends share this struggle with me. I don’t know what to do. He dreams about Minecraft. Draws pictures of what he is going to do once he is able to play Minecraft. Watches YouTube videos about how to play Minecraft. I have the same thing going on over here! All i hear about are creepers and procuring pig skin and bow and arrows- I will say it actually seems to make them think and not be completely mindless entertainment, but my 7 year old is beyond obsessed. Good luck! Glad to hear we arent the only ones with the obsession.